Some Sundays, particularly during Breast Cancer Awareness Month, women in black East Texas churches gather following services to be proactive against a disease that is killing them at an alarming rate. The elder women— who often don elaborate church hats, complete with rhinestones and huge bows—engage with their younger peers about breast cancer and self-care. 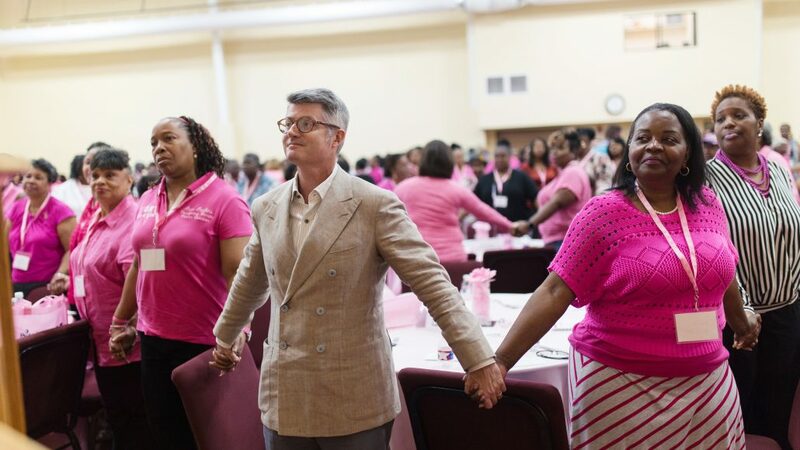 Usually draped in pink attire, East Texas Pin-A-Sister members show up at churches in the Tyler, Texas area to spark a movement. The congregation hears about a Breast Cancer survivor’s journey and the speaker urges them to pledge to get a mammogram. It’s usually brief and to the point, but often makes a lasting impact. Women then ceremoniously pin each other — affixing a tiny, shiny accessory that serves as a reminder to follow up on the pledge. To date, more than 7,500 women have been pinned. It’s a program that saves lives. 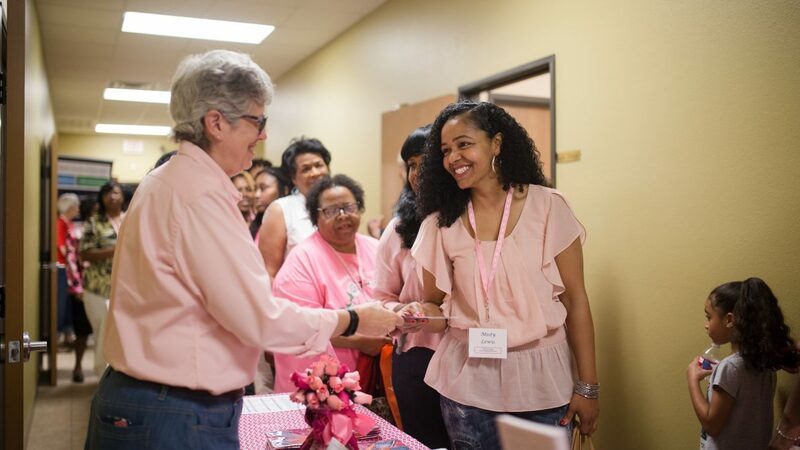 A breast cancer pinning ceremony at a church in Tyler, Texas. Pin-A-Sister is a tight-knit group in Tyler that promotes breast health ands the need for regular mammograms. Their committee is relatively small—about 15 members meet monthly on average— but their impact in the community is greater than they’d imagined when the group was established about seven years ago. Schwanda Moaning learned about Pin-A-Sister at her church. 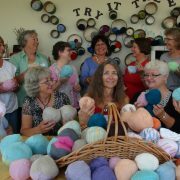 Inspired by a pinning ceremony, she vowed to get a mammogram, then kept up with her health, doing regular breast checks. Her promise saved her life: She was diagnosed at stage 3 in November 2011 when a sonogram illuminated two tumors. Surgery and chemotherapy followed in 2012. Schwanda Moaning learned about Pin-A-Sister at her church. Inspired by a pinning ceremony, she vowed to get a mammogram…. her promise saved her life. A doting mother who is now without cancer, Moaning eventually starting volunteering with Pin-A-Sister events. Motherhood, she says, is what made her encourage other moms, who she says often cite busyness or fear as reasons why they aren’t proactive in their health. She’d gone to support groups at her doctor’s office, but Pin-A-Sister added another layer of reinforcement. A few years ago, a community needs assessment conducted by a Tyler, Texas affiliate of Susan G. Komen for the Cure showed that women living in two area codes with a higher population of African American women had a higher incidence of breast cancer and in late stages. The women in this area also had a lower prevalence of breast cancer screenings. 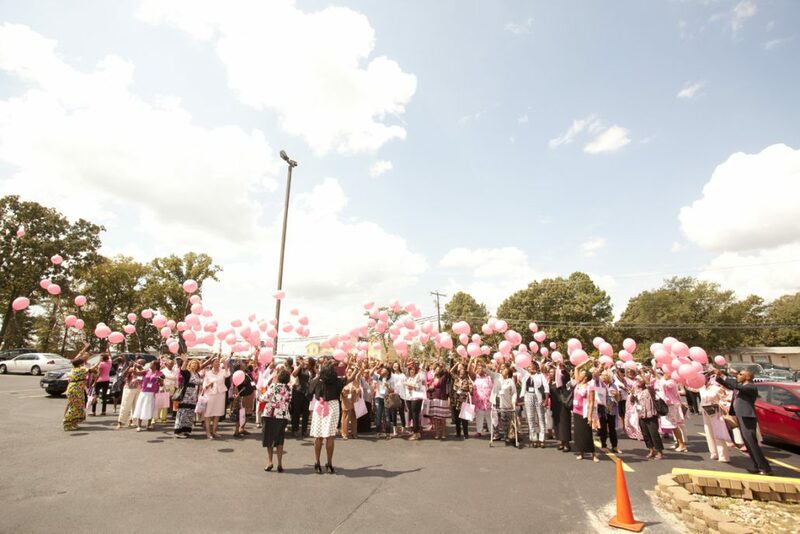 Upon studying the data, Regina Davis, director of East Texas Medical Center’s Breast Care Center, decided to offer a campaign to improve breast health awareness among the black women in the local community. In 2010, ETMC Tyler launched Pin-A-Sister. It was modeled after a program in Chicago by the same name, which encouraged both African American and Latina women to get mammograms on Mother’s Day. But Davis came up with a different strategy for year-round outreach that was sure to be successful in the deeply religious part of the state: They’d engage the church. 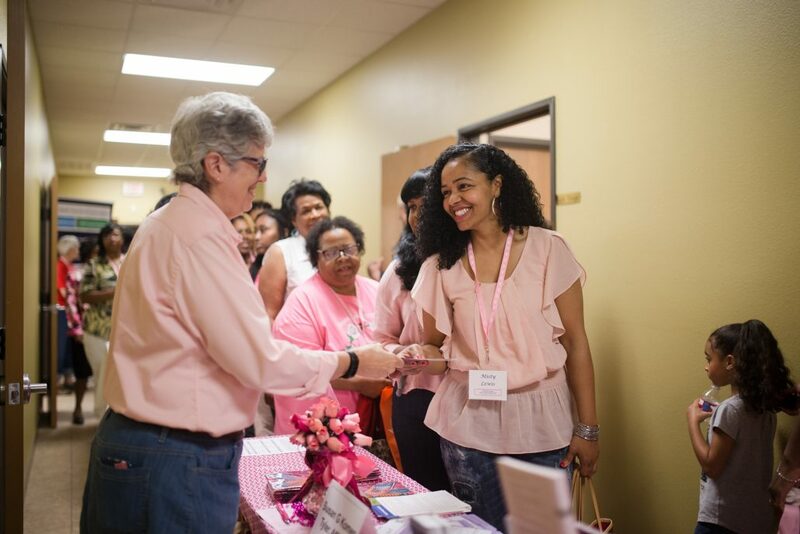 In its first year, Pin-A-Sister volunteers pinned 2,000 women, surpassing the goal of 600. Of the 80 African-American churches in Smith County, almost all —95 percent—have hosted pinning ceremonies since the campaign’s inception. One hundred women have been trained as “wise women”—community-based patient navigators— to assist women with scheduling mammograms and obtaining financial assistance. But the momentum for the now popular breast cancer campaign took a little time to rev up. The momentum for the now popular breast cancer campaign took a little time to rev up. At the first church visit, Davis sensed there was some reluctance to talk openly about breast cancer. “It wasn’t the fact that you didn’t have the passion,” she says. “It was just about having that conversation in a church setting.” Eventually, though, the reticence to talk about breast health went away. Measuring the success of the program beyond what is seen at ETMC Tyler has been a challenge, but they have been able to show through its cancer data registry a decrease in black women who present with late stage breast cancer at the hospital. According to their records, seven out of 19 black women in Smith County, Texas were diagnosed with late stage breast cancer in 2009. Last year, that figure was down to one out of nine black women. That’s a small sample size, to be sure, but no one can tell Davoria Ates, a Pin-A-Sister committee member, that the organization doesn’t make an impact. She would know: in 2007, she was diagnosed with early stage breast cancer. She didn’t handle the diagnosis well. Years later, still with no signs of cancer, she rolled up her sleeves to help those who’d been in her shoes. 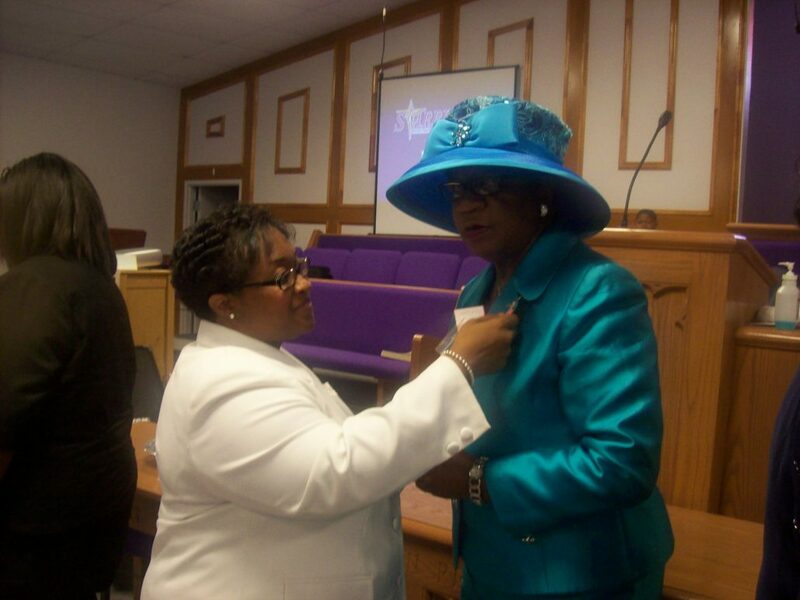 Jessie Bell, 61 is among the “wise women” with Pin-A-Sister and she’s been there since the beginning. The most critical information she shares is about the ways women who were under-or uninsured could get screenings and/or treatment through various programs. Worries about the cost is usually the reason they’re afraid to learn their status, she says. “A lot of times, it’s hard for us to reach out to women because they’ll say, ‘If I got it I don’t want to know. I ran into that a lot,” Bell says. And then there is the constant myth-busting. She said some older women feel they’re unlikely to be diagnosed if they’re advanced in age. Starting a movement, one woman at a time. Regardless of feedback, Bell doesn’t hold back. She makes constant contact with those who have pledged. If she knows an appointment is coming up, she’ll be calling. It’s because she’s experienced it first-hand. After a diagnosis in 2007, she underwent five surgeries, 30 rounds of radiation, plus five years of taking the drug Tamoxifen. “If we keep living, every woman will be affected by cancer, either themselves or a family member,” Bell says. That’s why groups like Pin-A-Sister are so crucial, especially in East Texas, where residents have some of the worst health outcomes in the state.